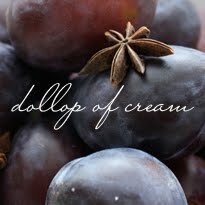 Dollop of Cream: turnip puff to the rescue! turnip puff to the rescue! Have you ever noticed how ugly most winter vegetables are? My theory is that they need to be ugly so we won't be tempted to eat them in the fall. Because if we did, we’d have nothing to eat in the winter. I have never been inspired by a turnip. It is hardly attractive, not to mention its odd pale-orange and purple colour. My friend Lisa – who has excellent taste in both food and clothing – raved about her family’s recipe for turnip puff. She told me how a holiday dinner at her house isn't complete without turnip puff. This woman is devoted to turnip puff. So when she brought me the recipe, I knew I should treasure it. I carefully put it in the vegetable section of my recipe binder . . . but two years passed before I could find myself inspired to make it. Now, I understand the devotion. 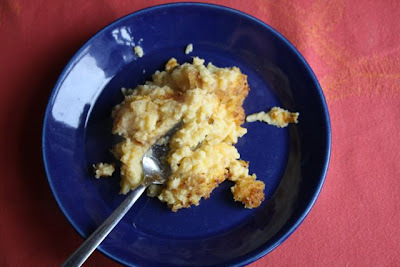 Let me take you on a journey from ugly vegetable to divine turnip puff. 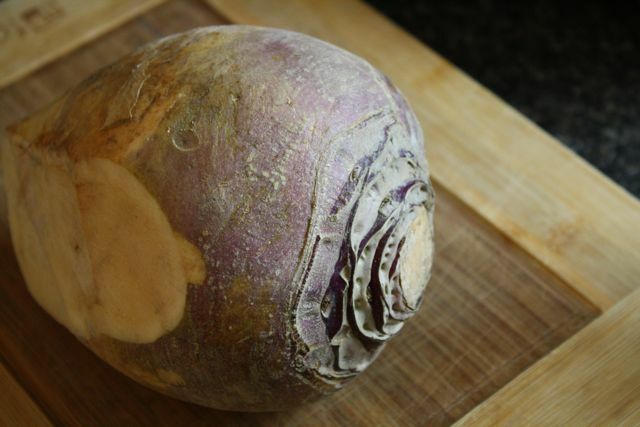 When I went to buy my turnip, the produce man told me that what we call turnip in Canada is actually a cross between a turnip and a cabbage. It's also called rutabaga. That explains its distinctive odour. 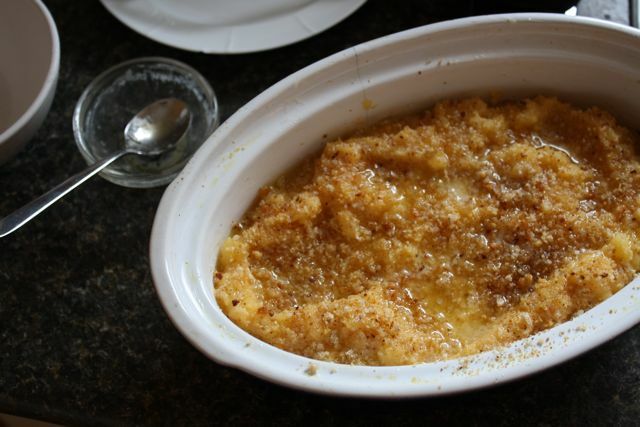 We decided together that my turnip puff recipe probably really wanted this crossed turnip, so I hefted it into my cart. Then I also bought a pure turnip to cook up later on. Once you have these nice cubes, throw them in a pot of boiling water. And boil them some more. Eventually, they get soft and their colour becomes a pretty golden-orange. After straining them, pull out the potato masher. I get pretty excited at this part, because I always like mashing unsuspecting vegetables and watching them become a whole new kind of food. 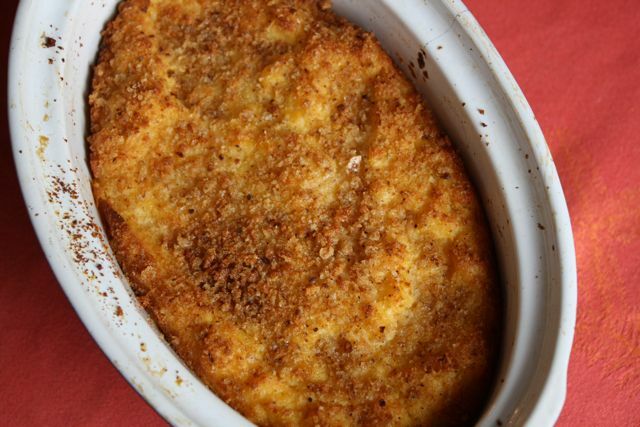 Stir in flour and almost everything else, and your turnip puff is almost ready to bake. Just need to scatter some bread crumbs and drizzle some melted butter . 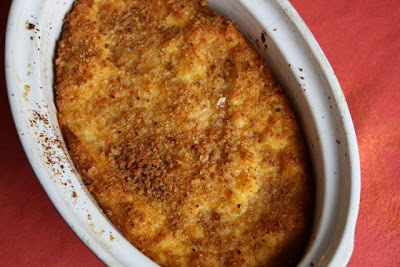 . .
Turnip puff in the oven! Now, the agony: will my turnip puff puff? Will it stay a soggy lump of mashed-up turnip? Is that a bit of – dare I say it – puff? This is not a dramatic turnip soufflé, all billowing and full of air. It is a puff. Puffs are gentler. Keep this straight in your head, so you can keep your expectations in check. After about 45 minutes, it should be puffy and golden-brown. Pull it out and admire what you have made. If anyone else is around, call them over to admire it, too. Look what you’ve done with a turnip! Eat right away. Even if it’s not Thanksgiving. Or Christmas. And it’s all alone on a plate. Just eat it and be happy. Because turnip is a very inspiring vegetable indeed. 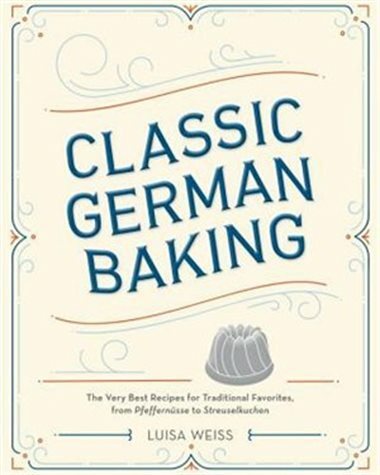 A note for the gluten-free among us: If you’d like to make this gluten-free, use the sweet rice flour and use gluten-free breadcrumbs. I made mine this way and it was scrumptious. 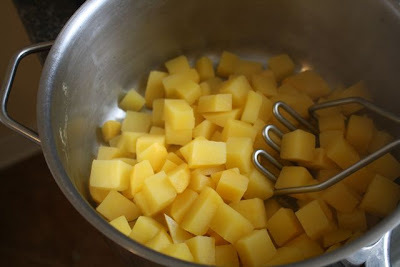 Boil for a long time until the cubes are soft. This took me about 30 minutes. In the meantime, mix the flour, brown sugar, baking powder, salt, pepper and nutmeg together in a small bowl. Set aside. In a separate bowl, beat the eggs. Set aside. Butter a casserole dish. Preheat the oven to 375 degrees Fahrenheit. When the turnip is tender, strain it in a colander. Rinse the empty pot with cold water to speed up the cooling process. 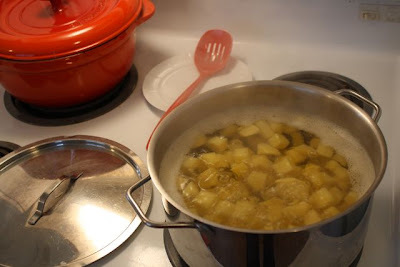 Also rinse the turnip in the colander with cold water. Tumble the turnip back into the almost-dry pot. Add 2 tbsp. butter. Mash with a potato masher. (This is easier than you think.) It should not be steaming hot at this point – only luke-warm or cool. As long as it’s not steaming hot, stir in the flour mixture in stages, sprinkling a bit at a time. Stir in the beaten eggs. Scoop it out into the prepared casserole dish. Scatter bread crumbs over top. Melt 2 tbsp. of butter and drizzle over. 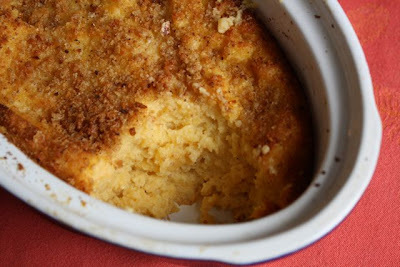 Put in the oven and wait for it to slowly puff up and for its topping to become golden. This should take 40 – 50 minutes. this looks great, I would never think to use a turnip like this. We are still in a winter vegetable rut here in the UK, parsnips, turnips, celeriac (do you have that in Canada?) and carrots. Bring on spring! This puff recipe might even encourage my children to eat turnip, they will eat it in a lamb stew and that is about it. I think your kids will like this -- even my skeptical husband did! We do have celeriac and I've had fun experimenting with it. 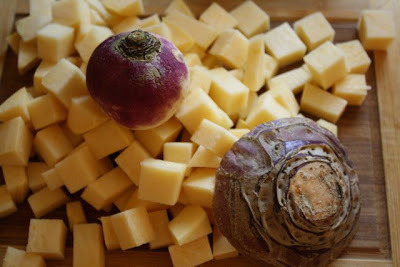 Around this time last year, I put up a recipe for creamy celeriac soup: http://www.dollopofcream.com/2010/02/ugly-vegetables-make-beautiful-soup.html. Maybe it will help you with the root vegetable rut? Spring is coming -- asparagus is just around the corner (I hope) . . .